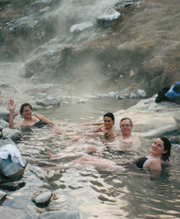 The Two Ravens area is centrally located between three good sized hot springs for your enjoyment, each one a little different in what it offers, besides the natural hot water. We are less than a mile from the South Fork of the Payette River with its amazing white water as well as shallow, sandy coves to cool off in on a hot summer afternoon. Within a mile of camp are two fishing ponds that are stocked with rainbow trout every two weeks in the summer. We can even furnish a fishing pole for you, but you must get at least a day license from the State of Idaho, unless you are 12 or under. We would be happy to connect you with the many other activities available in the area such as float trips, horseback riding, and white water rafting.